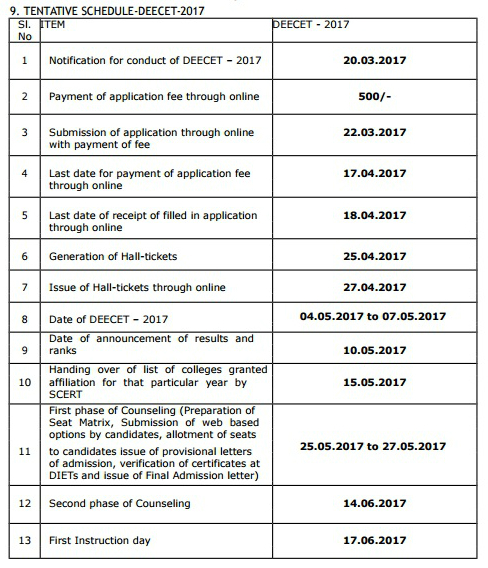 1.Online application for DEECET - 2017 are invited from candidates who intend to take admission into two years Diploma in Elementary Education (D.EL.Ed) in Government District Institutes of Education & Training (DIETs) and Private Elementary Teacher Training Institutions in the state to be conducted by Dept. of School Education, Govt of A.P on 04-05-2017 to 07.05.2017 in all 13 Districts of the state of A.P. DEECET will be conducted on 04-05-2017 to 07.05.2017 in all 13 Districts of the state of A.P. The test will be conducted through online in 3 spells. The fee prescribed for appearing for DEECET (including examination fee) is Rs500/- (Rupees Five Hundred Only).Candidates can pay the fee through payment Gateway between 22.03.2017 to 17-04-2017 and submit online application at the DEECET website http://cse.ap.gov.in between 22.03.2017 to 17-04-2017. Detailed procedure for applying ONLINE is given in the Information Bulletin. Candidates can download the “Information Bulletin” free of cost from the DEECET website http://cse.ap.gov.in from 20.03.2017 onwards. Candidates can submit their applications through online from 22.03.2017 to 17-04-2017. DEECET shall be conducted in all the 13 Districts of the A.P state. Candidate can choose any District of his/her choice for online examination center. C. Candidate should have obtained a rank in DEECET-2017 and should satisfy the eligibility criteria prescribed. D. Age Limit: The candidates should have completed 17 years as on 01-09-2017 . There is no upper age limit. I. The candidate who passed or appeared for the 10 + 2 during 2016-17 final Examinations (Qualifying Examination) or its equivalent are eligible to appear for the entrance test . But, they should have passed the qualifying examination by the time of admission. III. Candidate belonging to “O.C” and “B.C” communities shall secure minimum 50% marks in DEECET. For Scheduled Caste, Scheduled Tribe and Physically Challenged candidates the minimum qualifying mark for allotment of seats reserved under the respective categories will be 45%.Thatis to say candidates belonging to SC and ST communities should secure 50% of marks for consideration against seats under OC / NCC / CAP / Sports category. The Examination related material will be preserved for six months in online from the date of Examination and no application in this regard will be entertained beyond this period.